A collection of things handmade: sewn items, embroidery, appliqué, wirework, paper cuts. Also tutorials & stitching patterns. I teach five and six year olds this year, a bit younger than previous years. As an autumn/harvest project I wanted to make some simple scarecrows that the children could personalise and can easily be displayed in limited space. 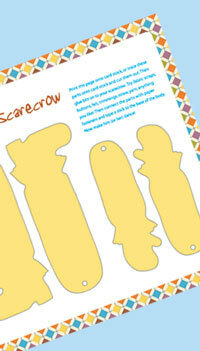 I couldn't find a template I liked for a scarecrow so I made up this simple one - if you'd like this friendly but featureless scarecrow, click here. It's featureless so the children can create their own clothes and faces using whatever materials they'd like. When they're finished we'll use paper fasteners to make them movable and glue on a stick to make them puppet-like and appear as though they could stand in a field. I'll supply stuff to glue on: scraps of fabric, yarn, buttons, straw, felt, trimmings and whatever else I have laying around my craft room (probably quite a bit.) For children this age I will pre-cut small pieces of fabric that can be glued in a haphazard patchwork effect. Older children could cut out their own whole shirts, trousers, hat, boots, etc. Check back here to see the finished scarecrows. If you make them, send me piccies! Like the template! Lukie bought some tracing paper yesterday and knows what he'll use it for now. May give it to school too. I'm sure they are looking for autumn projects. So cute! Thanks for sharing this project. thank you! we made some today- I love seeing what my kids come up with. Thanks for this adorable template! My kids couldn't wait to make these again this year!!!! We had a lot of fun! No Cal native living in the UK who loves learning and pursuing creative ideas.